If you haven’t seen the students in yellow jackets and caps posted recently at various intersections around the university, perhaps you’ve been going too fast. Starting on September 20, the Bilkent Young Traffic Team began working to encourage student cooperation in traffic-related issues. The team members from different departments are spending about 10 hours a week to help create a safer traffic environment on campus. They have been trained by the security staff in traffic related issues such as radar readings and first aid. 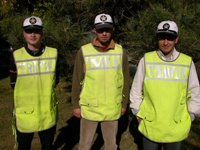 There are 5 students on the student traffic team; Erhan Efe (BF/III), Gürkan Hoşgit (CTIS/II), Evren Mercan (HART/IV), Necdet Soylu (ACC/I) and Nalan Turcan (ACC/III). These students will monitor pedestrian crossings, assist the security staff in taking radar readings, help maintain order in parking lots, and inform their fellow students regarding traffic issues on campus.